You know one of the things I love? When you download an app ‘cause it’s free and get Absolutely Hooked On It. That’s how it was when I found Inventioneers by Filimundus AB (iTunes/Android). Normally, I’m all about apps for preschoolers, but I was intrigued by the thought of learning physics by making my own inventions—not usually a preschooler thing. “Okay,” I thought, “I’ll bite. It’s free, and at worst I can just delete it.” To start with, I was just going to see how the app worked. I tried the first section and after much fiddling (bit of a learning curve) got my invention to work. I was so excited! I went on to the next page and got that one to work, too. Then I realized that the little stars floating around were prizes. If I could get parts of my invention to hit them, then I got a bonus! An hour later I had to drag myself away. The free download of Inventioneers offers one open “chapter.” This one chapter is more than enough to tell you whether you’d like to make the one-time purchase of $1.99 to open five other chapters and the Create Your Own Invention section. Each chapter is actually a setting in which you create inventions to solve problems. There are 42 “pages” in each chapter, each page offering a progressively more difficult task. So maybe, like I was, you aren’t quite sure how an app can let you explore physics and make inventions. In the app, gravity works on objects, as does force. You build inventions, taking these forces into account, to accomplish tasks. 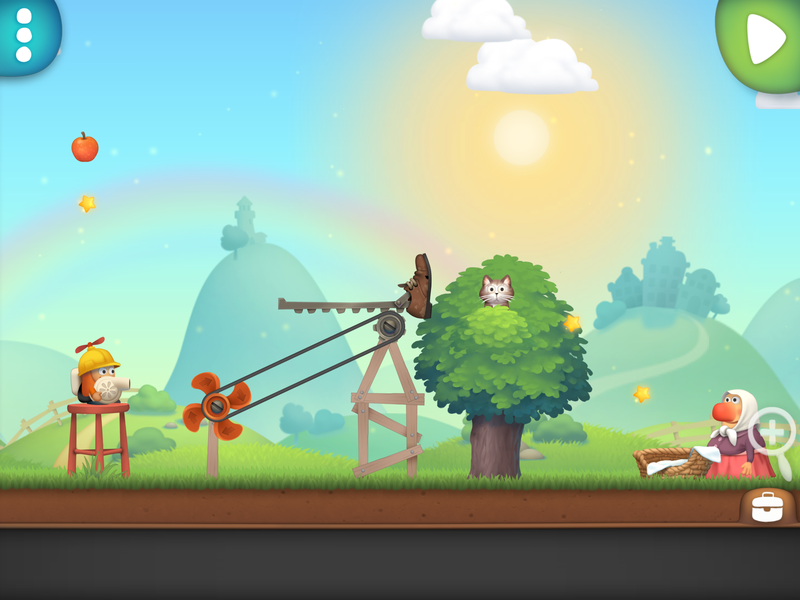 To start with, the app lets you work on simple problems, only giving you the props you need to make your inventions. Sort of like handing you all the pieces to a slingshot, telling you that a rock needs to hit a can and letting you figure out how to put the pieces together to accomplish the task. At first, you aren’t quite sure what to do. Then, through experimentation, you figure it out. So, what sort of raw materials does the app give you to accomplish these tasks? I’m so glad you asked, but I’m not going to list everything because it’s extensive. Here’s just a sample. For building there are funnels, boards, pipes, bricks, and cheese (who knew?). Things to drop, things to throw, and things to balance on all make an appearance. And then there are things like gears, spokes, fans, motors, ramps, horns, clocks, springs, balances, fire, explosives, and more. 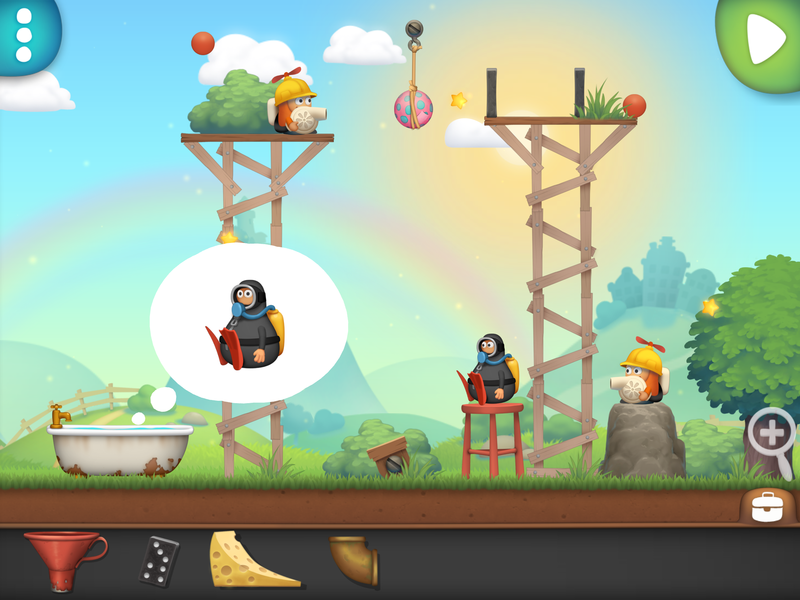 There are also these little guys called Inventioneers. They are tiny characters in the game “with special abilities like blowing air, creating fire, magnetism, and shooting lasers.” All these materials REALLY come into play once the game is unlocked and you can access the Create Your Own Invention section. The chapters give you a task to accomplish but the Create section allows you to imagine your own task. My only complaint, if any, was the fact that you’re allowed to set up parts of your invention to begin in mid-air. This wouldn’t work in real life, obviously. Maybe it’s just me, but I couldn’t figure out how to make some of my inventions work without this quirk. Once I accepted that things work a bit differently in app-world, I got on just fine. This app isn’t for preschoolers. It would be appropriate for parents and elementary kids to sit down together and work through the problems (if the parent could resist taking over!). I can see it sparking all kinds of conversations and tinkering with physical objects. This would also be a fantastic app to have available on children’s area tablets in the library or for free play in classrooms. The vast number of possibilities and the educational aspects make this app worth the in-app purchase price. Posted on January 28, 2015, in Apps and tagged Awnali Mills. Bookmark the permalink. 1 Comment. my 4 yr old son and I love this app! My favorite aspect is that there are multiple solutions that will work, so sometimes his ideas which seem impossible to me will end up working anyway. A great one for joint media engagement!